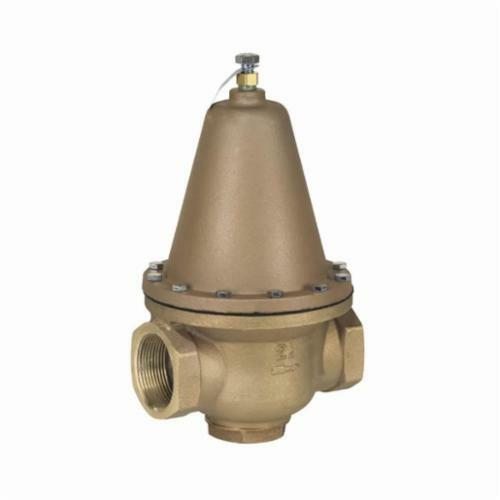 Series LFN223B, LFN223BS Lead Free* High Capacity Water Pressure Reducing Valves are used in commercial, industrial, and institutional applications to reduce incoming water pressure for protection of plumbing system components and to reduce water consumption. It consists of a triple-coated corrosion preventative Lead Free* cast copper silicon alloy body construction, an enlarged diaphragm, spring cage and seat orifice for super capacity performance, sealed spring cage for waterworks pit installations and thermal expansion bypass. Available with NPT threaded female inlet x NPT threaded female outlet with (LFN223BS) or without (LFN223B) strainer. Maximum Working Pressure: 300psi (21 bar), Adjustable Reduced Pressure Range: 25 to 75psi (172 to 517 kPa), Standard Pressure Setting: 50psi (345 kPa).